Dogs of any age, size and breed can suffer from urinary crystals. Urinary crystals form slowly, as mineral deposits build up in the bladder. The crystals are painful and uncomfortable, dangerously blocking the flow of urine. If enough crystals build up in your dog's bladder, they form a bladder stone, which may need to be surgically removed. Veterinary treatment is essential for a dog suffering from urinary crystals in order to keep him healthy. Crystals and bladder stones occasionally block a dog's urethra. Surgical blockage removal is the common form of treatment followed by manual emptying of your dog's bladder. A prescription diet increases urination and changes the pH of the urine, as well as decreases minerals in the diet known to cause crystals and stones. The diet is fed exclusively, as "cheating" on the diet only prolongs a urinary condition. The prescription diet dissolves urinary crystals and bladder stones within 4 to 16 weeks, as well as prevents them from reoccurring. Some veterinarians use urinary acidifiers to dissolve and prevent urinary crystals. Acidifiers are a controversial treatment for canine urinary crystals because the exact dosage and safest dosage is still unknown. This method flushes any crystals or small stones from the dog's bladder and urethra. An anesthetized dog's bladder and urethra are filled with saline solution via catheter. The veterinarian compresses the dog's bladder manually, which flushes out the saline solution as well as any stones/crystals that have gathered in the bladder/urethra. This method can also be used to remove small blockages. Occasionally urinary crystals or stones cause urinary tract infections, as well. 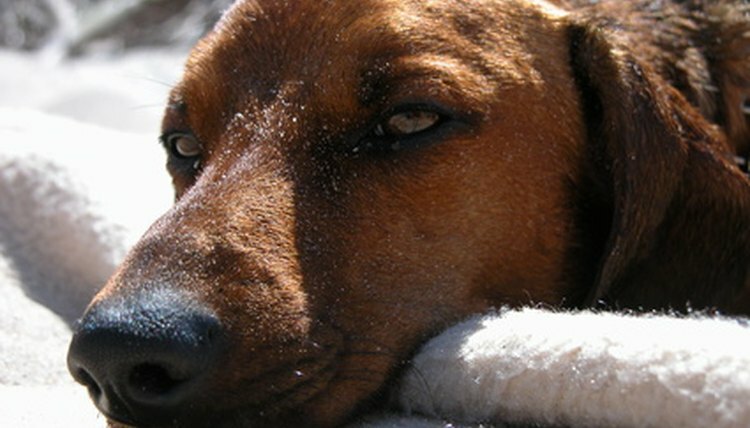 Antibiotics are prescribed to treat the infection and make your dog more comfortable. Administer any and all medication as directed by your veterinarian, and follow the full course of treatment.